Some people talk of "roughing it" in camp. Well, a tenderfoot may find it rough and uncomfortable. But there is no "roughing it" for an old Scout; he knows how to look after himself and make himself comfortable. 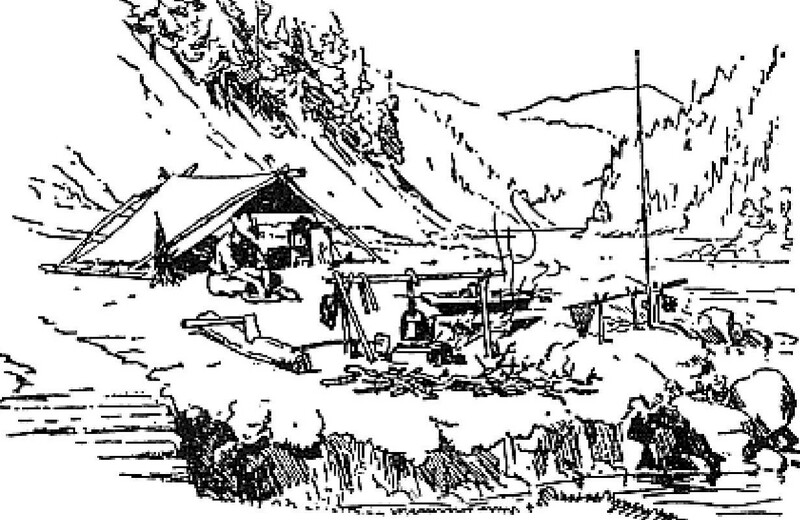 If he has no tent, he doesn't sit down to shiver and grouse, but sets to work to rig up a shelter or hut for himself. He chooses a good spot for it where he is not likely to be flooded out if a storm of rain were to come on. Then he lights a camp fire, and makes himself a soft mattress of ferns or straw. An old Scout is full of resource. He can find a way out of any difficulty or discomfort. To my mind, the best place for a camp is in or close by a wood where you have permission to cut firewood and to build huts. So if you know of an owner in your neighborhood who may let you use a corner of his wood, there is your chance. Inside a wood the ground may be damp and the trees will continue dripping in wet weather. Be on the look-out for this. If you build good rainproof huts, you need no tents. 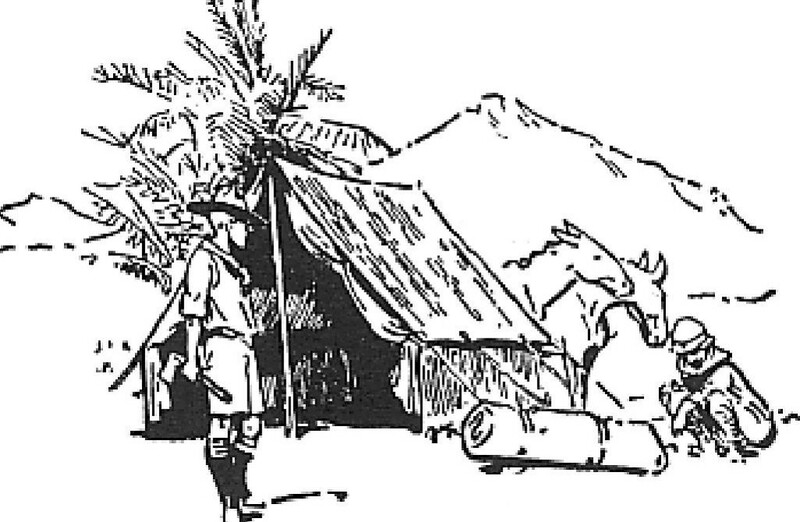 Instead of a fixed or "standing camp", many Scouts prefer a "tramping camp". Of course, it is much better fun to go over new country. But to make a tramping camp enjoyable you want good weather. In arranging your tramp, your first point will be to select the line of country you want to visit, and mark out from the map where you will halt each night. You will find that about five miles a day is as much as you will want to do. You might want to make a trek-cart for carrying your tents, blankets, waterproof sheets, and so on. For a standing camp, from which you don't mean to move, I prefer the kind used by explorers called a ridge tent or wall tent. They are unequalled for comfort and for making the camp look neat. If they have fly-sheets, they will be quite waterproof, even if you touch the inside of the tent, and the fly-sheet will keep the tent cool in hot sunshine and warm in frosty weather. strap for hanging things on the tent pole. It is important that enough sleeping bags or blankets be provided to enable each Scout to make up a separate bed. A good kind of bread for camp is what the Boers and most South African hunters use, and that is "rusks". Rusks are easily made. You buy a stale loaf at the baker's at half-price, cut it up into thick slices or square junks, and then bake these in an oven or toast them before a hot fire till they are quite hard. They do very well instead of bread. Soft bread easily gets damp and sour and stale in camp. This trench should lead the water away downhill. Dig a small hole the size of a teacup alongside the foot of the pole into which to shift it if rain comes on. This enables you to slack up all ropes at once to allow for their shrinking when they get wet. 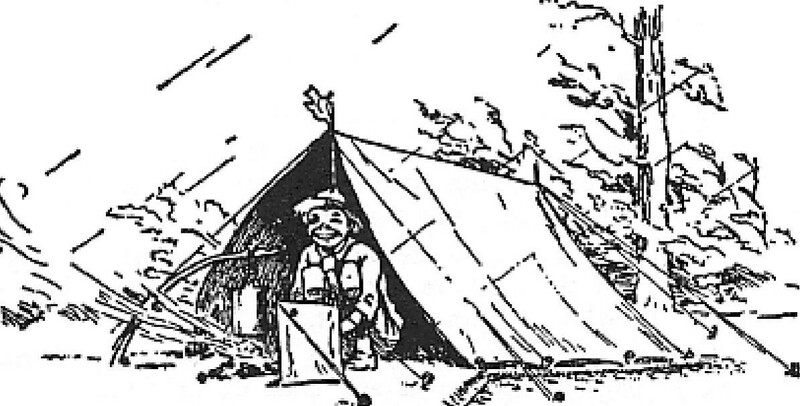 You can smile at the rain if you have pitched your tent properly. All water has a large number of germs in it, too small to be seen without the help of a microscope. Some of them are dangerous, some are not. You can't tell whether the dangerous ones are there, so if you are in doubt about the water, it is safest to kill all the germs by boiling the water. Then let it cool again before drinking it. In boiling the water, don't let it merely come to a boil, and then take it off, but let it boil fully for a quarter of an hour, as germs are very tough customers, and take a lot of boiling before they get killed. The cooking fire is made to leeward, or down wind of the camp, so that the smoke and sparks from the fire don't blow into the tents. Cooking fires are described on pages 124-127. 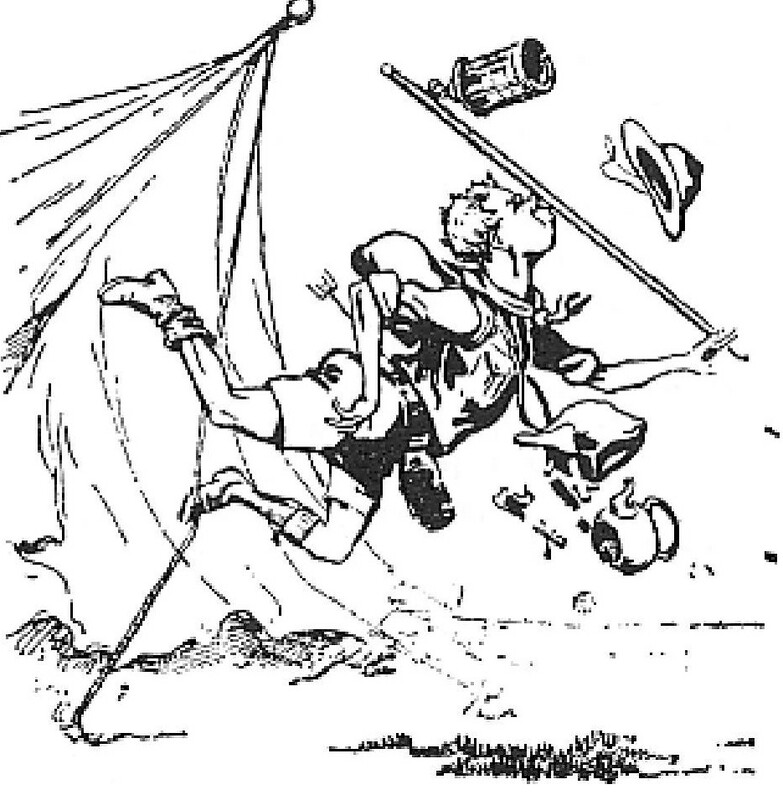 Old Scouts always take special care to keep the kitchen particularly clean, as, if scraps are left lying about, flies collect and are very likely to poison the food, and this may bring sickness to the Scouts. He finds out that tents are supported by ropes. Another very important point for the health of the Scouts is to dig a trench to serve as a latrine. 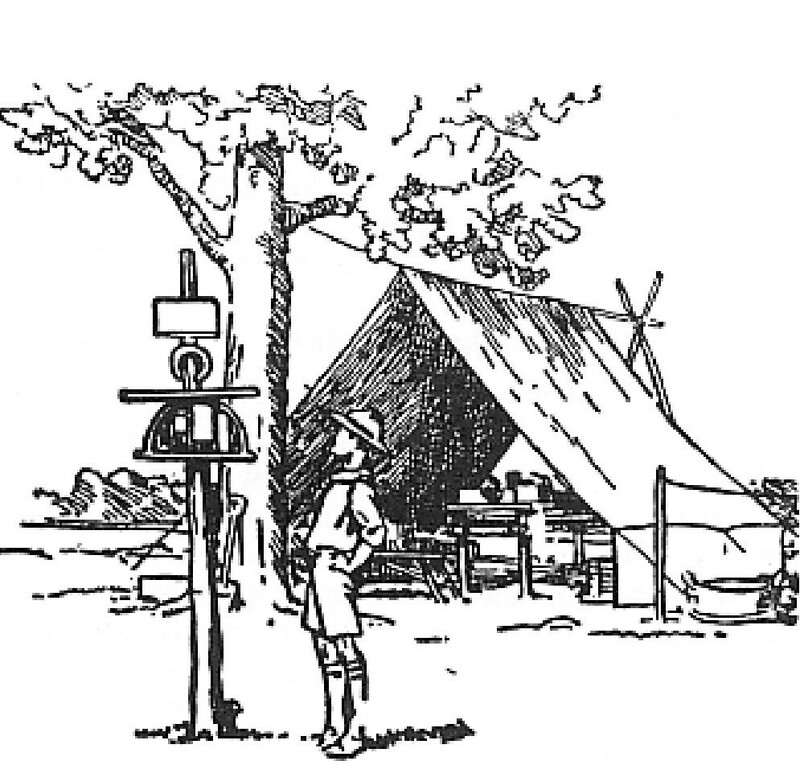 On reaching the camping ground the latrine is the very first thing to attend to-and all Scouts bear this in mind. A bulletin board may be put up for "Standing Orders"
7:00 a.m. Turn out, air bed, wash, etc. There should always be a bathing guard posted, while bathing is going on, of two good swimmers, who will not bathe themselves but will be ready, undressed, prepared to jump in at any moment and help a bather if he is in difficulties. The guards should not bathe until the others have left the water, and a life line must be available. A camp is a roomy place. But there is no room in it for one chap, and that is the fellow who does not want to take his share in the many little odd jobs that have to be done. There is no room for the shirker or the grouser-well, there is no room for them in the Boy Scouts at all, but least of all in camp. There are many ways of making a comfortable bed in camp, but always have a waterproof sheet over the ground between your body and the earth. Cut grass or straw or bracken is good to lay down thickly where you are going to lie. To make a mattress, set up a camp loom and weave it out of bracken, ferns, heather, straw, or grass, six feet long, and two feet nine inches across. With this same loom you can make straw mats, with which to form tents, or shelters, or walls (page 133). Another good way of giving yourself a comfortable bed is to make a big bag of canvas or stout linen, 6 ft. long and 3 ft. wide. This will do to roll up your kit in for travelling. When you are in camp you can stuff it with straw, or leaves, or bracken etc., and use it as a nice soft mattress. Camp candlesticks can be made by bending a bit of wire into a small spiral spring; or by using a cleft stick stuck in the wall; or by sticking the candle upright in a lump of clay or in a hole bored in a big potato. A glass candle shade can be made by cutting the bottom off a bottle and sticking it upside down in the ground with a candle in the neck. The bottom of the battle may be cut off by putting about an inch or an inch and a half of water into the bottle, and then standing it in the embers of the fire till it gets hot and cracks at the water-level. Or it can be done by passing a piece of string round the body of the bottle, and drawing it rapidly to and fro till it makes a hot line round the bottle, which then breaks neatly off with a blow, or on being immersed in cold water. But remember that cut glass is a dangerous thing in camp. You can make a camp candlestick in a number of different ways. It is something to know how to sit down in a wet camp. You "squat" instead of sitting. Natives in India squat on their heels, but this is a tiring way if you have not done it as a child. It comes easy if you put a sloping stone or chock of wood under your heels.